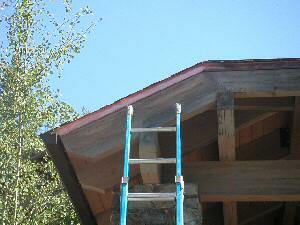 is the ability to do a quick and easy protection of copper trim. Copper arrives bright and shiny, but will quickly turn dark from reaction with the oxygen and moisture in the air. This is why it arrives on the job site with a protective plastic film on it. Some people like the aged look, but others would like it to stay shiny. Spraying the copper work as soon as possible with S-B-S Sealer will keep moisture and oxygen away from the surface and greatly prolong the new appearance. Here is how you can restore copper if it is too late. You will want to experiment on a small piece first to be sure the process is right for you. You may or may not be able to restore it to looking brand new, but you will be able to make a great improvment. See pictures below. Aldon "Grout Residue Remover" contains acid. This blend of acid and surfactants will react with the copper and restore it to a bright finish. Dilute with 8 parts water to start, then make it stronger if necessary. Once the copper is bright again, it will darken even faster than when new. Therefore, the next step must be taken as soon as possible. 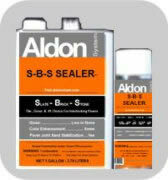 Spray with S-B-S Sealer. 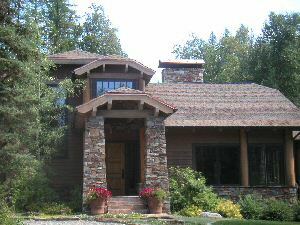 The sealers job is to keep oxygen away from the copper, therefore, two applications will insure a more full and complete coating. 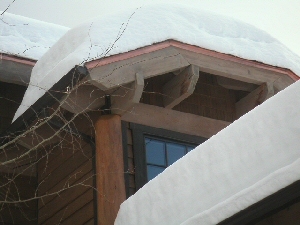 This is a picture of a woodbox with a copper roof. The top half is before it was restored. The bottom half is after restoration. 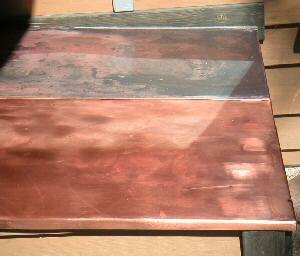 These are before and after pictures of copper edge trim. It had become totally black and did not look like copper at all. Summer 2005 - The left half has been cleaned and restored with Aldon "Grout Residue Remover", then promptly sprayed with Aldon "S-B-S Sealer" to keep it that way. Being in the higher position, the copper trim was done before the woodwork was cleaned and re-stained by the painters. After copper trim and wood finish has been refinished. Here it is at 5 months later. In this case, it is holding up very well. However, when copper has become very highly oxidized, the effect can continue below the surface, and it might blacken again. Therefore, it is best to test the process over a few months time before doing a large amount of this restoration work. At 3 years after the time of restoration and protection (summer 2008), the copper has not darkened.